Gunnevera was on the outside looking in to the Breeders' Cup Classic when pre-entries were announced, but the hard-knocking colt did his trainer proud on Saturday with a second-place finish in the $6 million race. A 4-year-old son of Dialed In, Gunnevera came hurtling down the Churchill Downs stretch under Irad Ortiz to finish just one-length shy of Accelerate at the wire. Fifth in last year's Classic and then third in the Pegasus World Cup, Gunnevera struggled when sent after the Dubai World Cup. First he suffered a bout of colic, then had part of his left front hoof torn off during the race; he faded to finish eighth. This year, Sano will come back to the Pegasus with a horse nearing the best form of his career. Meanwhile, Classic third-place finisher Thunder Snow has headed back to his winter base in the UAE to prepare for a title defense in the Dubai World Cup. Connections were pleased that the 4-year-old son of Helmet was able to exorcise his Churchill Downs demons: Thunder Snow showed no signs of the bucking antics that derailed his Kentucky Derby chances in 2017. In the Classic, Christophe Soumillon had the colt close to the rapid early pace set by Mendelssohn and McKinzie, and Thunder Snow looked like he might be the winner at the top of the stretch. Alas, he tired a bit in the final furlong, but held on to finish third by a nose over the late-running Yoshida. “The race was crazy early on, I mean they ran 22 seconds [for the first quarter-mile], which was too fast, but my horse is tough,” trainer Saeed Bin Suroor told racingpost.com. “The horses that raced at the front all finished nowhere except for Thunder Snow, he stayed fighting to the end. 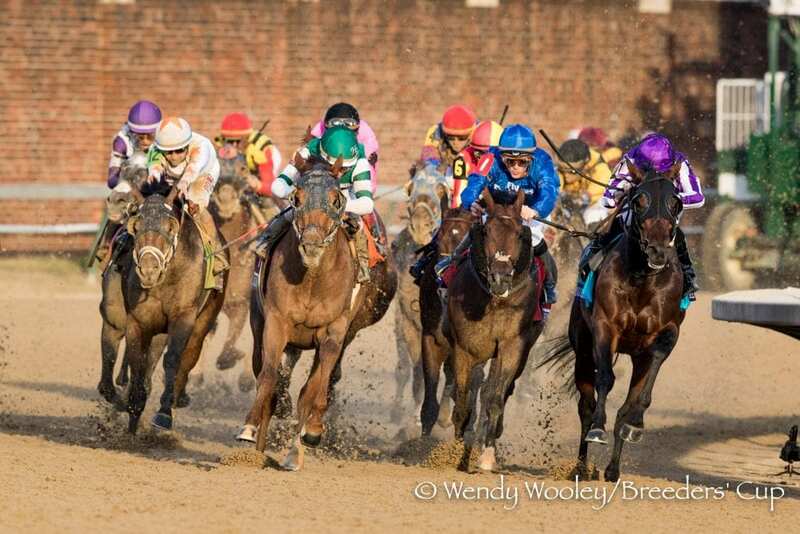 This entry was posted in Breeders' Cup, NL List and tagged Antonio Sano, Breeders' Cup, breeders' cup classic, Christophe Soumillon, churchill downs, dubai world cup, helmet, Irad Ortiz, kentucky derby, pegasus world cup, saeed bin suroor, thunder snow, travers, woodward by Paulick Report Staff. Bookmark the permalink.